RSS Captor - RSS Client You Need! Welcome to RSS Captor web-site! 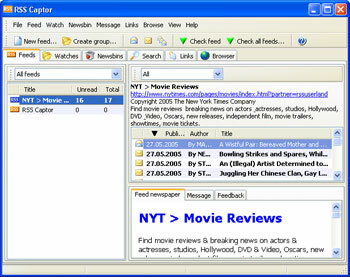 RSS Captor is a powerful, highly configurable yet easy-to-use RSS client. We have designed it especially to help you deal with your growing volume of news as quickly and efficiently as possible. RSS Captor is RSS client you need! Download Now! - RSS Captor is about than 2.5 Mb! No need to download 22Mb .NET package! ORDER NOW! - RSS Captor single license costs US $19.95! READ THE LATES NEWS USING FREE VERSION OF RSS CAPTOR !